The evidence of my hundreds of photographs, already taken in the past month, is proof that Istanbul is a city of experiences like none other. I do not have command of the English language well enough to be able to find perfect words to describe all of what I’m feeling when I walk down brick-paved hills so steep, when I squint to gaze upon the blue seas, when I taste salty olives and cheese on my lips, when I mournfully hear the prayer call or when I smell pungent, roasted meats. My senses are on fire. I have never felt so alive. How can I adequately express in words the combination of influences on this great city? Christians. Jews. Muslims. Europe. Asia. Ottoman. Roman. Byzantium. How do you pick one book from a full library? How do you choose a favorite kitten from the litter? How do I decide what to share and what to keep? When I open my front door and step out into this marvelous energy, I step into a torrential downpour of possibilities . . .
One of my most enjoyable excursions has been hopping aboard a ferry, to cruise northward, along the Bosphorus River. 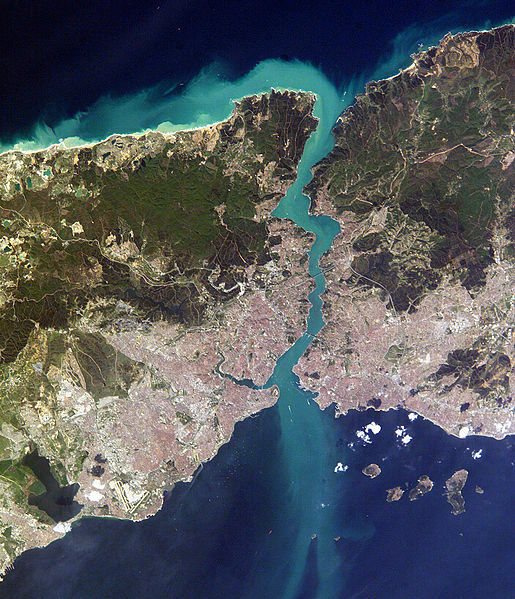 This expansive river, about 30 km (18 miles) long, connects the Black Sea to the north and the Sea of Marmara to the south, which leads to the Aegean Sea, and then on to the Mediterranean. On the western bank is European Istanbul; on the eastern bank, Asian Istanbul. Two bridges and a multitude of ferries connect the east and the west here. In the photo below you can see the two bridges. I live on the western, European side, just to the south of the southern-most bridge. There are a variety of ferry excursion companies and timetables to choose from. 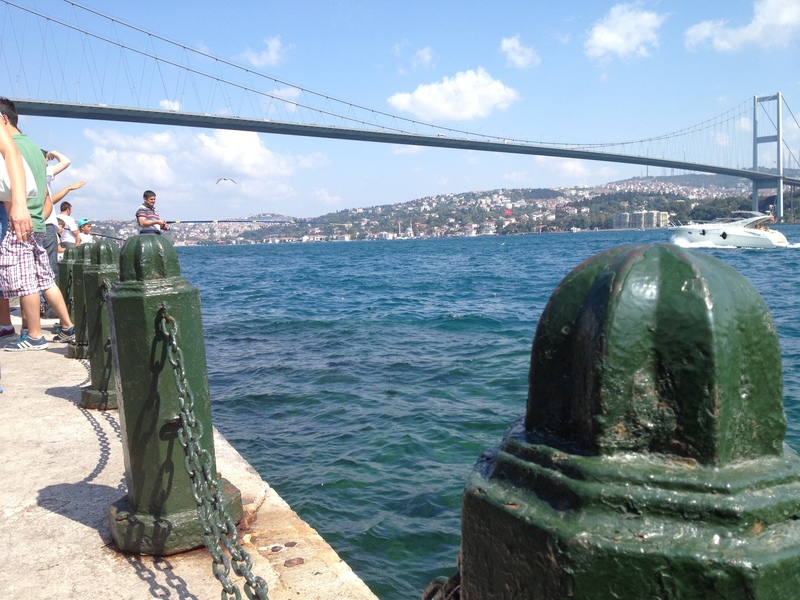 Our group chose a short, hour-long cruise, roundtrip from Ortakoy. This ride took us just north of the second bridge before turning around and traveling back toward home along the Asian side of the river. Multi-hour, long trips to the Black Sea, are also available, as well as evening twilight cruises, which I think would be terribly romantic! This hour long, luxurious ride cost $10 Turkish Lira, which is around $5 USD. Well worth that! Time passed quickly and I wasn’t ready for the ferry to dock. This was a wonderful, and relaxing, way to enjoy views of the city. As I stepped off, I realized, again, that I’m not on vacation. I live here! I can go back and ride another cruise anytime. Thanks for reading. This week why not find a new way to experience your city? Amazing, Anita! Again, thank you for sharing. Gloria, so glad you are reading along. You were my BEST teacher ever. Thank you! Anita, Thank you for sharing. I cannot write, I cannot believe that with all that has happened you are able to do so. Please get all the rest you can but absorb slowly, and follow your friends advice to come back another day. Know that you are loved. Mom . Hi, Mom. You are correct…there is NO time, but I just have to start! I’m getting so behind! There’s so much to tell! Anita, so happy for you! All sounds amazing, including your time in CA with Sophia! I have not responded in a while, but I have been reading! Wishing you the best as you begin a new chapter. Your new students are blessed to have you as their teacher! Love & miss you. Hey Shell-Bell. I am very happy to be doing what I’ve dreamed of doing for so long. It is quite a learning curve–much more than I ever anticipated, but I love being challenged. Come see me! I miss you. Traveling vicariously by your side is a joy…look forward to each week’s post. I echo all others, thanks for sharing. Linda, please get back on that plane and fly a bit further east. Miss you. Have a wonderful time in France. You are such a gifted writer that I felt I was right there with you. Thanks for sharing…love you! So kind! Thank you. 🙂 You have so very much to do with my being here. I will forever be grateful. Sweet, Connie, DO IT! I love your writing! I need to get back to reading yours! Thank you for sharing your adventure with me. After being in Istabul only weeks ago, I share your passion for this amazing city, which I hope to revisit. Your descriptions are eloquent and spot on. I am missing the wonderful feta, fabulous tomatoes and cukes, figs and dates mosaics and helpful people. And oh, those patterns and colors in mosaics. Thanks for sharing a peek at your new life! I’m glad that you’ll keep blogging so that I can explore vicariously. Best wishes in your first weeks of school….those kids are lucky to have you! Whew! I never thought I’d get back to blogging. Thanks for the encouragement. I hope to start being somewhat more regular. Best wishes to you too! Ditto all around.